When watching Martin Scorsese films, I often feel like I’m missing something. It’s not that I don’t think most of the ones I’ve seen are good, it’s just that I rarely find them as masterful as it seems other people do, who tout him as something along the lines of the greatest active director. Looking through his CV I find only a small handful of films I’d consider to be truly great – Taxi Driver, Goodfellas, The Departed and After Hours are the four that spring to mind. The King of Comedy is good. So is Hugo. The Colour of Money, Gangs of New York and Casino are OK. Shutter Island was disappointing, Bringing Out The Dead was forgettable and The Wolf Of Wall Street is a giant waste of time. 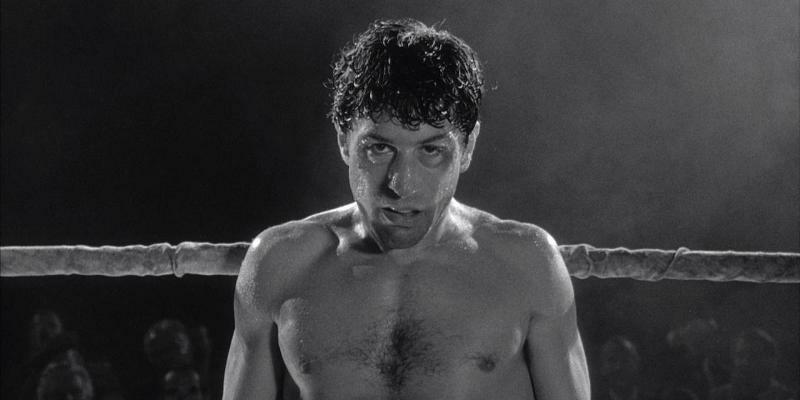 Raging Bull is one of his films deemed greater than many others, some say it’s his best, but I’d steered clear up to now mainly because of the subject matter. I’m not a sports fan, and boxing in particular holds no interest within me whatsoever. I see no appeal in watching, participating or being involved in any way. If a friend of mine announced he was taking up boxing, I’d assume something had malfunctioned inside of his head, and would recommend a therapist. Basically, I’ve always thought I wouldn’t get on with Raging Bull. As with the Rocky franchise I’d assumed it would be a story I wouldn’t care about, surrounding characters I could never comprehend. As it turns out, that’s kind of the point. 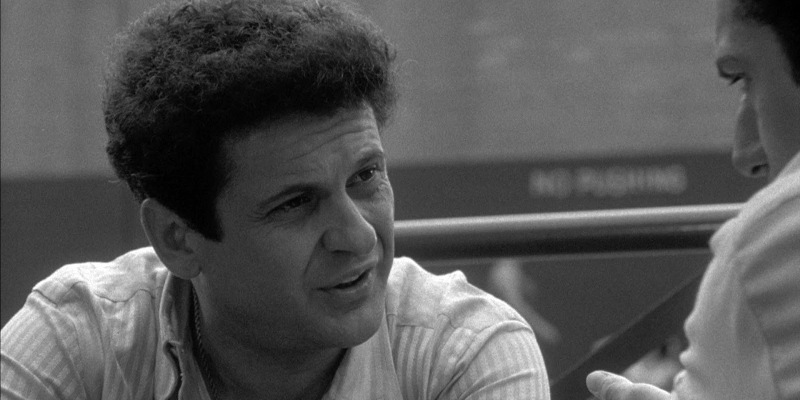 Jake LaMotta isn’t a guy you’re supposed to root for. This isn’t Rocky‘s underdog saga, a guy who could have had it all given a second shot at greatness. This is the story of a guy who beat everyone up so roughly that no-one wanted to fight him, a lumbering brute whose inability to make life choices without the use of his fists sees him achieve everything he sets out to, only to throw it all away and learn nothing in the process. A guy so stubbornly obtuse you feel no pity for his downfall, because he barely acknowledges it himself. At least, that’s where it ends up. To begin with, there are elements of humanity to the guy. In his first fight that we see, in 1941 against Jimmy Reeves, LaMotta knocks his opponent out 9 seconds before the end of the 10th round. The referee’s count is cut short by the round’s bell, ending the match. 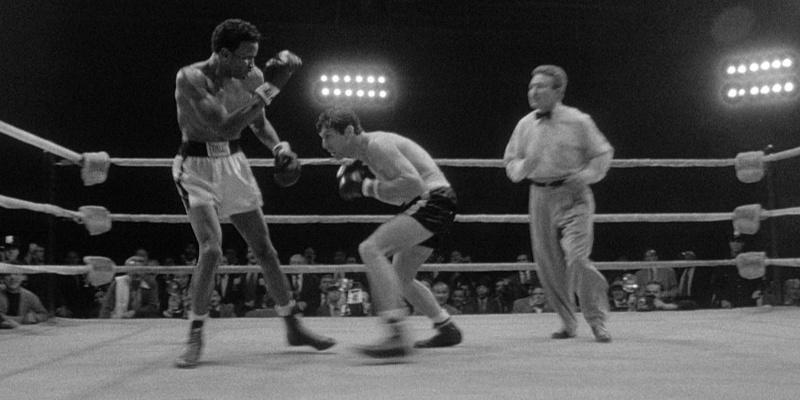 Reeves had evidently performed well earlier in the fight, and the judges award the win to him, regardless of the fact that he is unable to stand up, whilst LaMotta is pacing furiously in the opposite corner, the crowd in uproar at this mistrial of justice. That’s a great place to start the story, with LaMotta receiving his first major loss to a guy he by all rights just defeated. It’s possibly the only point in his life that we could feel empathy towards the guy. From then on in he cheats on his wife with a 15-year-old girl he would later go on to marry and abuse when he assumed she was getting too friendly with other men, get arrested for serving alcohol to really under-age girls and beat up his only friend in the world, his brother/trainer/manager Joey, in front of his brother’s family no less. Like I said, this isn’t a guy you’re necessarily supposed to root for. 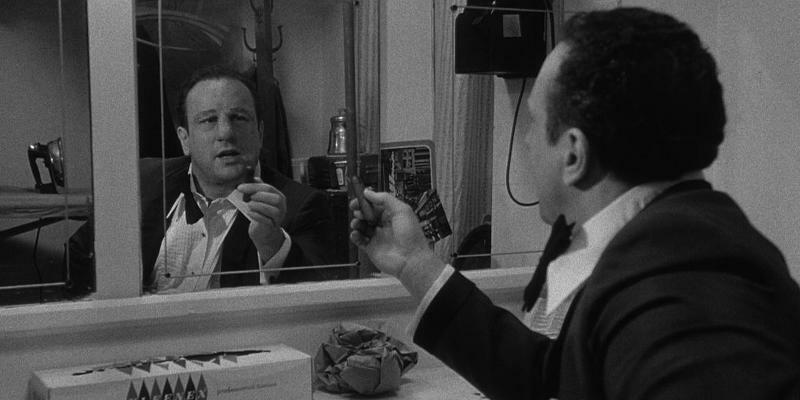 Acting-wise this is the DeNiro show through and through. You can’t detract from his performance here, it’s phenomenal. And I say performance, but really what’s on screen cannot be considered one. That taut, snarling beast in the ring is a world away from the doughy, slow would-be entertainer he becomes in later years. Pesci is also great in his first major role – it’s easy to see why Scorsese would use him again to great effect in Goodfellas. Story-wise I could have personally done with a fewer boxing matches, but they at least allowed for some tremendous cinematography and effects work in the ring. 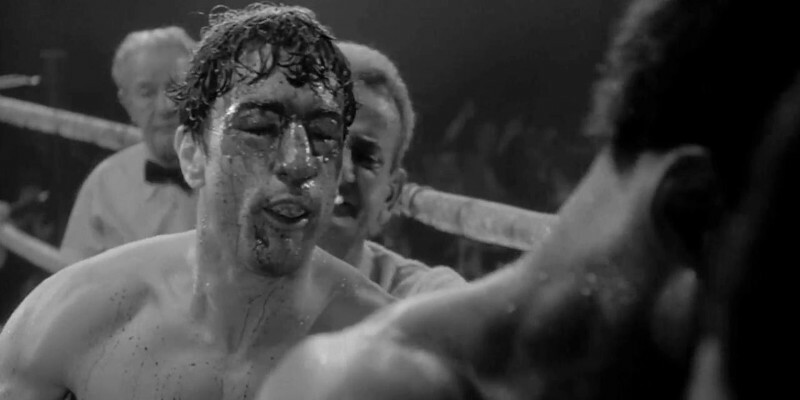 The movement and compositions of the fight allow for these great scenes and shot styles, and of course there’s the Goodfellas-esque long shot of Jake walking from his changing room to the ring, with hundreds of screaming fans along the way. Some of the fights – in and out of the ring – get quite brutal, with one fight in particular seeing Jake intent on making his opponent as ugly as possible by the end. All in all, whilst it’s not a film I’ll be rushing back to any time soon because of the subject matter, there’s still a great deal to appreciate here. In the pantheon of Scorsese’s films I’d group this in the good category alongside Hugo and The King Of Comedy, though it’s probably the best of those three. This entry was posted in 08/10, 1001, 5-Star 500, Blind Spot, Choose Film, Empire Top 301, Empire Top 500, Review, TF 100, The List and tagged Cathie Moriarty, Frank Vincent, Joe Pesci, Martin Scorsese, Raging Bull, Robert DeNiro by jaycluitt. Bookmark the permalink. I’ll take that, even though I consider it great. Then again, I’m a big Scorsese fan and love Wolf of Wall Street. DeNiro is spectacular, here. You’re right about not being able to detract from his performance. As for subject matter, great sports movies aren’t about the sport they depict, but about the people involved in them. So I hope that doesn’t scare you off from revisiting it. I don’t know if it’s a film that I’m ever likely to go back to without having a reason to, such as someone else wanting to watch it, or podcasting/reviewing in the future, but I could say that about a lot of films. That’s not a slight against this one as much as there’s just so many other films I’d rather watch or re-watch.